Atletico de Kolkata edged past Mumbai City FC in a thrilling encounter at the Rabindra Sarobar Stadium, Kolkata in the first leg of the Hero ISL 2016's first semi final. 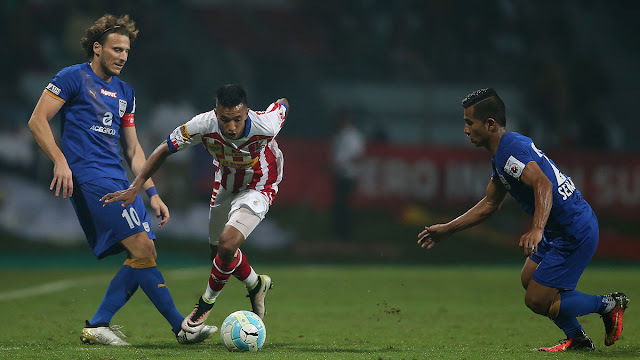 Ian Hume's brace gave Kolkata a one goal lead going into the second leg as ATK won the game 3-2. All the goals came in the frantic first half. Mumbai City FC however will be take two important away goals which means if they manage to get a 1-0 or a 2-1 victory at their home in the second leg of the semi-finals on 13th December, they will progress to the finals. Mumbai City FC captain and marquee player Diego Forlan will be unavailable for selection as he will remain suspended after being sent off from the first leg after receiving two yellow.